It’s a classic Halloween activity: the homemade haunted house, replete with cold spaghetti "worms" and bowls of peeled-grape "eyeballs." Remember? 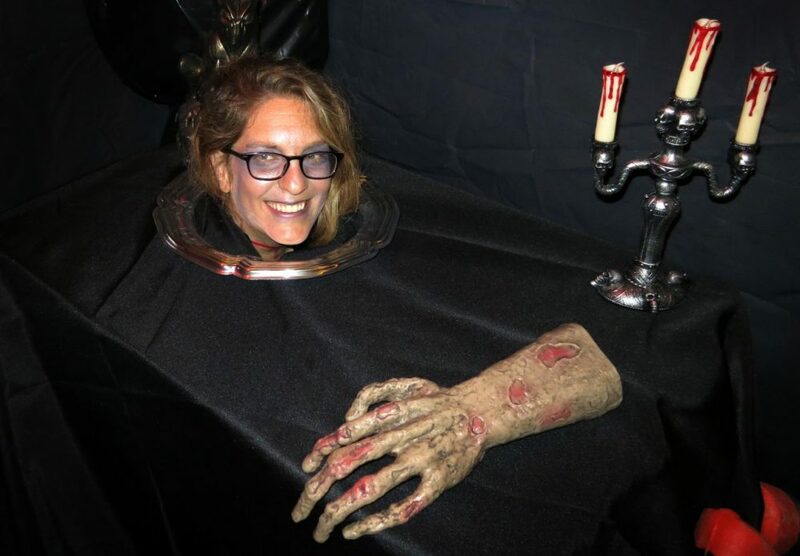 "You can be really artful about how you scare people without a lot of gore," says Northeastern University professor Lisa Feldman Barrett. "And I thought, well, who better to do that than a lab that studies the science of emotion? We can use research to predict what the effects will be, to make it super-scary without a lot of blood and guts." Some of their scare techniques may not seem to differ much from those of amusement park haunted houses, but they're devised by neuroscientists who live and breathe the brain. "What your brain is doing is making predictions based on past experience," Barrett says as she leads the way into the labyrinth in her basement. "So if we set up things to look really kitschy at the beginning, with a lot of props, your expectation is, 'This is going to be pretty lame, this is not going to be very scary.' And when you walk in, we will violate that expectation." When visitors are unsure whether a figure is alive or a statue, they often "freeze in uncertainty," she says, just like a rat in an experiment when it's not sure whether it's about to receive a small electric shock. Also, certain special effects fire up specific parts of the brain, Barrett says, including the amygdala, an area important for detecting uncertainty or novelty. The neurons in the amygdala are very tuned to eyes, "to whether the eyes are open or shut or moving, and how much white. The more white there is, especially in a still face, the scarier people find it." Many of the the haunted house effects are aimed at increasing uncertainty, Barrett says, "because uncertainty enhances arousal — I don’t mean sexual arousal, I mean feeling activated and worked up and jittery." "This, to me, is not a very artful way to create fear. A gentler, more interesting way — and frankly a more pleasant, fun way — is to curate uncertainty. Because we are not going for terror here, but for enjoyable, exuberant fear. In our own work, we show that fear feels different (and the brain patterns are different) for different types of fear — not all fear is unpleasant. So fear is not a single thing — it is a whole population of instances that vary from one another." "When there is a lot of uncertainty, and the brain has trouble predicting what is coming next, a person gets worked up — feeling tense — because really, the brain is preparing to learn so that it can take in the information it needs to predict better the next time around when in a similar situation. And the brain often interprets this tension as 'fear' when the context is right — like in a haunted house." Makes you see the whole experience a little differently, doesn't it? Barrett’s 16-year-old daughter, Sophia, came up with the idea for the haunted house when she was just 5. And she has witnessed the power of some of its scare techniques — even on her neuroscientist mom. "My mom always goes through a test run right before we open the haunted house," she says, "and even though she knows exactly what’s coming, and she even directs her post-docs and grad students to do certain things, she gets legitimately scared and will scream. Even though she said, 'OK, now you jump out like this' — and then it’s, 'Oh my God!' "
So that’s another lesson from the haunted house: Some responses to what you perceive are so powerful that even understanding your brain doesn’t mean you can control them. "The effect of the sensations on your nervous system are not something you can control," Barrett says, "and that’s really what we’re going after. The haunted house donates all its proceeds — more than $12,000 over the past 10 years — to the Greater Boston Food Bank. It draws up to 500 people a night, the Barretts say. And by the way, for kids — and adults — who aren’t into being terrified, when Sophia’s dad, computer scientist Dan Barrett, welcomes visitors in his role as the greeter ghoul, he offers three options: No scares, middle scary and super scary. When a guest wants no scares, "I just shout ‘No scares, friendly monsters only!'" he says. That means the monsters will just kindly wave at the guest, and take off their masks if asked. For "medium scares" — the monsters might jump out at you but not touch you, and might growl but won't yell — he sounds a bell-like tone of warning. And for "super-scary," he sounds a different tone and "Oftentimes, I will shout 'Fresh meat!' to the monsters."